The RASopathies constitute a group of rare genetic disorders. They include Noonan syndrome and Neurofibromatosis type 1 (each of them having a frequency of about 1:3000), as well as less common related syndromes (cardio-facio-cutaneous syndrome, Costello syndrome, LEOPARD syndrome, Legius syndrome). 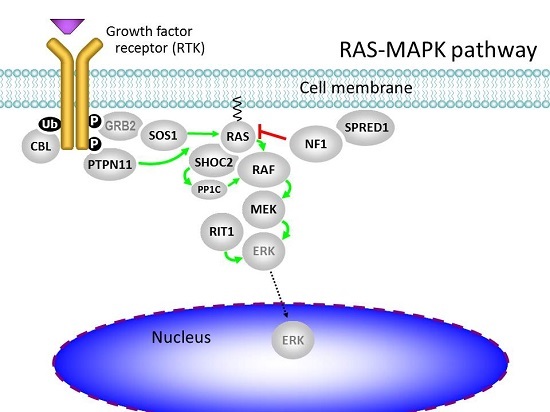 Their common molecular basis is a dysregulation of the RAS-MAPK signaling pathway due to mutations in various genes. Clinical features include impairments of growth and development, cardiac defects, skeletal anomalies, predisposition to malignancy, characteristic craniofacial abnormalities, skin and other anomalies. The clinical expression of the symptoms is highly variable. Nevertheless, many affected individuals have significant impairments of health and life quality. Neurocognitive deficits and cardiac disease represent the most important aspects of long-term morbidity. The German Network for RASopathy Research (GeNeRARe) is an interdisciplinary consortium of excellent national research groups from basic as well as clinical science, that are active in that field. The consortium’s major goal is to increase the knowledge on molecular pathogenesis and pathophysiology of RASopathies in order to explore novel clues for a causal treatment of these disorders. Research will be focused on aspects that are particularly important for long-term prognosis, namely neurocognitive deficits and hypertrophic cardiomyopathy, but the consortium will also address the pathophysiology of medical conditions that have been paid less attention to in previous research, such as epidermal anomalies and cellular senescence. Collection of standardized clinical data from RASopathy patients, analysis of genotype phenotype correlations, and the development of innovative diagnostics are further goals of the consortium. From this multimodal research approach, we expect the following major results: the improvement of clinical and molecular diagnosis of RASopathies, a more precise definition of disease subtypes and individual risk assessment, deeper insights into molecular mechanisms and their responsiveness to pharmacological intervention. This will eventually channel preclinical and clinical studies.